Sometimes music is simply fun. You can put a certain CD into your car audio system and your two hour drive feels like 10 minutes because the music you’ve got cranked up makes the time fly. Fun music isn’t always good music exactly; it can be more of a guilty pleasure. Today’s band is not only fun to listen to – but the featured album is also really good, a rare find. Taking a journey back to 1990 in a setting of Huntington Beach, California, it was a time where surfing was king and the area was dominated by a much more laid-back culture. A group of gentlemen decided to start a Led Zeppelin cover band, and made a decent living going around local clubs and playing the crowd’s favorite Zeppelin tunes. In 1992 they released a demo of their own recordings called “In The Good Old Days.” They were going by the band name The Fischer King at that time—but the demo and the band name were less than top notch. After tweaking the lineup a bit, they decided to go away from being a rock band and begin their ska/punk era under the new name Reel Big Fish. In 1995 their first album dropped and became and underground hit spreading via word-of-mouth. The talk was so positive, Mojo Records signed them to a deal. Their sophomore album Turn The Radio Off was released in August of 1996 and was their first under the Mojo brand. 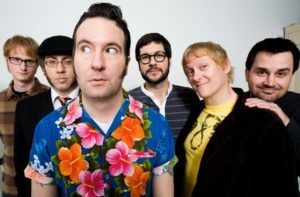 Ska was becoming a more mainstream genre at the time, and the Reel Big Fish put out a solid record at the right time. The single “Sell Out” saw major radio play and lots of time on MTV. The song would be featured in video games and television, giving the band a bit more credibility in the industry as a whole. They were even in a film—the creators of South Park wrote a movie called BASEketball in which the band was featured actually performing for a crowd of actors so the extras wouldn’t to have to fake their excitement. To date, the record has been certified Gold by the RIAA and peaked at #57 on the Billboard 100. While the band continues to make music to this day, they couldn’t follow up on the success of this album and began to go through some turmoil. The ska revolution died out on pop radio forcing them to reinvent themselves yet again. Being a kid when I first heard this, I remember it being really fun to listen to. When I put this on now, I still get that same feeling. It’s one of those records that gets your toes tapping and makes you want to sing along. Almost universally acclaimed by critics, it’s easy to see why. I’ve heard tortured puns describing the album as “the fish have grown into sharks” and things of that nature which are really awful, but probably apt. If their debut album lacked production and a complete feeling, that was all erased with this effort. Turn The Radio Off is arranged perfectly composition-wise—and for a band that featured so many horns, you would guess everyone has played their instrument for decades. It was just about a perfect album coming out at the perfect time. If you’re not familiar with ska music in general, this is a great introduction. It’s faster tempo, upbeat styling with lots of brass, bass and drums. How can you resist that? For $5 dollars today, give a new genre a try and enjoy the ride. Editor’s note: The album does have an advisory label. Sorry, kids—this one is for your parents.